It's been all about paper flowers this week - small wonder, as it is the merry month of flower-filled May here in the northern hemisphere. I'd like to introduce you to Paula Bauer, a self-professed folded rose addict. 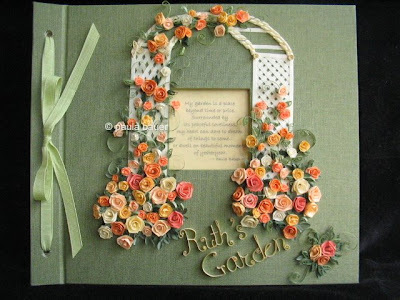 Take a look at this beautiful rose trellis journal cover she designed for a custom order. 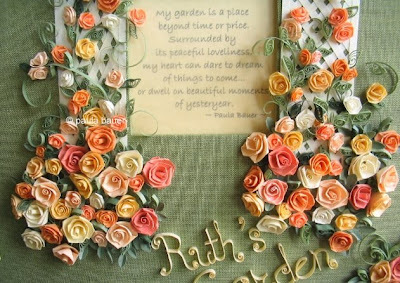 I love the way Paula wove paper strips to create the trellis and how the roses spill over its confines the way they do in real life. Folded roses are one of those bugaboo techniques that often frustrate those of us who do paper quilling. When I was first learning, I remember having a devil of a time getting them to look like they were flowers rather than torpedoes - the centers kept springing up and out. Luckily I had met Paula, owner of Gem State Quilling [edit: site no longer available], via an online quilling group and she kindly talked me through her method. Want to learn to make folded roses, Paula-style? Here's my folded rose tutorial. As a busy mom of five, Paula finds that roses are something really easy to do whenever she has a spare moment... she can fold a pocketful no matter where she happens to be. When she gets back to her desk, she simply repositions the folds as needed, glues the ends, and has an assortment to use in projects. 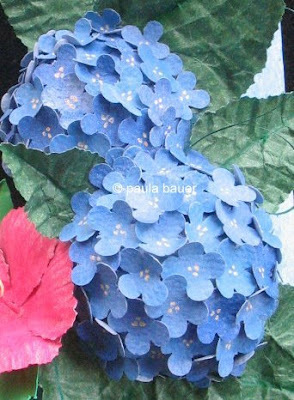 Her paper hydrangeas are gorgeous too! So glad you are enjoying them. I bet Elizabeth would show you how and I'd be happy to answer any questions too. I have a couple of online tutorials in the pipeline, so be on the lookout! Thanks so much for featuring me, Ann and mentioning my instructions. You have placed me between some pretty amazing paper artists and I'm feeling a tad 'simplistic' next to these astounding works....their scope and scale in particular! I especially appreciate the shout-out on Sally's antique paper filigree piece. I'm hoping to gain wide coverage of it in the paper arts circles so fans of historical paper artwork become aware of its upcoming auction.